PPC's Guide to PCAOB Audits is a time-tested, proven audit approach designed to perform a public company audit under PCAOB standards. The Guide is specifically tailored to meet PCAOB and SEC requirements, and it includes all the guidance and practice aids you need to perform both an integrated audit and a financial statement audit only. PPC's Guide to PCAOB Audits is really more than a guide - it is a comprehensive service that keeps you up to date with the changing public company audit environment year-round. It includes two complete updates of the practice aids and text guidance each year (at mid-year and year-end), plus two comprehensive current development e-newsletters issued quarterly between Guide updates to cover current developments affecting your PCAOB audits. 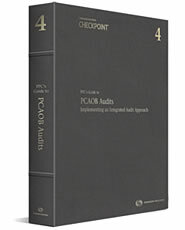 The Guide provides detailed guidance and practice aids that address the unique aspects of performing a PCAOB audit, including:?